A new play about the mother of an iconic figure (Mother of the Maid) and a musical remake of a Hollywood classic (King Kong) deliver modern feminist perspectives on familiar material from European history and pop culture. The play has some depth and an exquisite lead performance while the tuner is cotton candy. The latter has an exceptional star as well, but it’s a giant puppet. 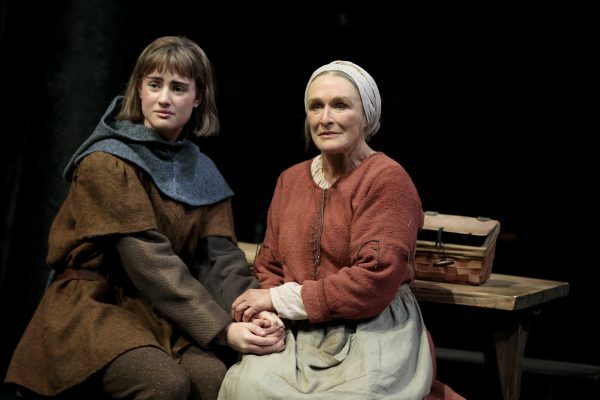 Grace Van Patten and Glenn Close in Mother of the Maid. Christiani Pitts (left) with King Kong. 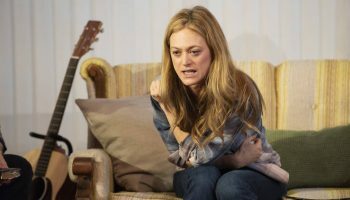 The new musical version of King Kong, imported from Australia, also recast its female lead with a modern slant—as well as its title character. Ann Darrow, the role originated by Fay Wray as the quintessential screaming damsel in distress, is now a roaring warrior (a feisty Christianni Pitts) on equal footing with her giant simian captor, here seen sympathetically as a victim of greed and exploitation rather than as a horrifying monster. Similar updating took place in the 1976, 2005 and 2017 film remakes of the 1933 original. 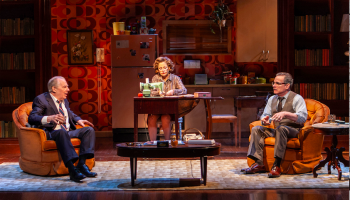 But none of the human characters in Jack Thorne’s scanty book register as more than props for the real star of this show—a 20 foot-tall, 200-pound animatronic puppet which displays more honest emotion than any of his flesh-and-blood castmates. 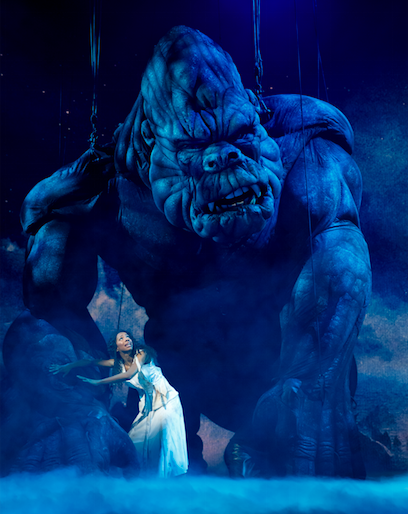 Operated by a small army of manipulators, the Kong puppet dominates the stage of the Broadway Theater, providing thrills as it lumbers close the first row and seems to run through a 1930s New York and the creepy Skull Island (created by Peter England’s atmospheric video and scenic design.) 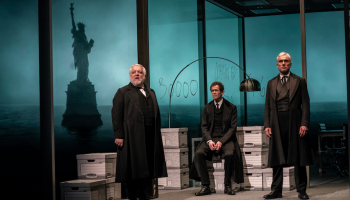 Puppet designer Sonny Tilders and “Kong/Aerial Movement Director” Gavin Robins deserve a special Tony Award or the Drama Desk which created a puppet design category a few seasons back. Kudos also to sound designer Peter Hylenski for fashioning a frightening aural experience. As for the non-Kong portions of Kong, from Eddie Perfect’s less-than-perfect pop songs to the broad acting, they are simply marking time until the great ape makes his entrance. Director-choreographer Drew McOnie does keep the action moving at a fast pace, so much so that this audience-friendly thrill ride feels as if it belongs at Universal Studios in Orlando rather than on Broadway. If all you’re after is a theme-park attraction and if a credible book, score or characters aren’t that important to you, Kong is king. Mother of the Maid: Oct. 17—Dec. 23. Public Theater, 425 Lafayette St., NYC. Tue 7pm, Wed 1pm & 7pm, Thu—Fri 7pm, Sat 1pm & 7pm, Sun 1pm. Running time: two hours and 10 mins. including intermission. $55-$150. (212) 967-7555. www.publictheater.org. King Kong: Opened Nov. 8 for an open run. Broadway Theatre, 1681 Broadway, NYC. Tue 7pm, Wed 2pm & 8pm, Thu 7pm, Fri 8pm, Sat 2pm & 8pm, Sun 3 pm. Running time: two hours and 20 mins. including intermission. $49-$175. www.telecharge.com.